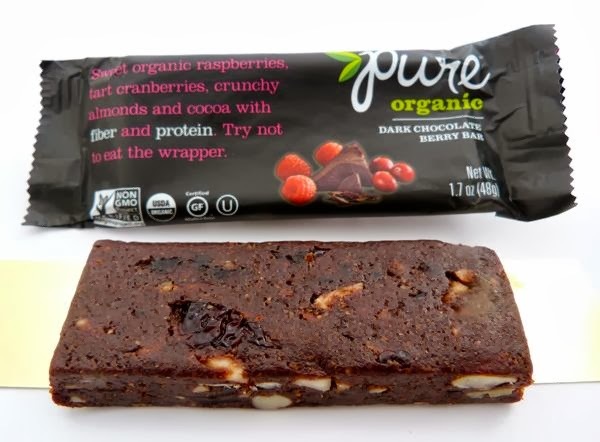 This dark, dense Pure Organic Dark Chocolate Berry* Bar from The Pure Bar Company (Newport Beach, CA) was moist and chewy. Made from fruits, nuts and cocoa powder, and sweetened with agave nectar, this organic bar was satisfying, and a healthier choice than a candy bar. *The berries used in this bar were cranberries (sweetened with apple juice), and a bit of natural raspberry flavor. Today was Day #5 of Chocolate and Berry Theme Week.